﻿ Accessible design toys ｜Corporate Information｜TOMY Company, Ltd.
What are accessible design toys? Accessible design toys are toys for the general consumer market which are also fully enjoyable by visually or hearing disabled children. By simply adding a few minor innovations we can make our toys more accessible and enjoyable for more children in the world. For example, by putting a raised dot on the ON side of a switch (to make it tactually distinguishable), or by a vibration feature along with a beeping (so a child can "feel" a "Wrong Answer!" or a "Danger!" notification without hearing it), or by applying different textures to different colors (for instance on board game pieces). In addition to children, making toys easier to use for blind/hearing impaired mothers and fathers is also an important aspect of accessible design toys. Since these toys are sold in the general consumer market, printing designated symbols on their packages for easy identification of their qualities, including a "guide dog mark" for toys suitable for visual disabilities, and a "rabbit mark" for toys suitable for hearing disabilities. To print these marks on packages, the toys must be reviewed and approved as "accessible" by the Japan Toy Association Accessible Toy Committee. If one toy manufacturer put a raised dot near the ON switch of their toys, while another put it near the OFF switch, consumers purchasing the toys would be left in confusion. Therefore, it is very important to establish standards (for instance of how and where to put the raised symbols) and follow them. 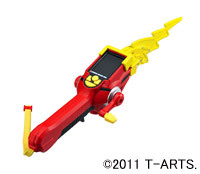 TOMY operates according to its internal quality standard which incorporates these "raised dots" and some other simple innovations that comply with industry standards. For persons with visual disabilities, toys may become "easier to use" if the ON switches and the battery boxes are tactually marked. However, the most important purpose of a toy is that it is not simply be "used", but "enjoyed". 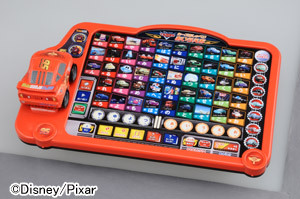 In addition to toys with tactile markings for easier operation, toys clearly shaped like actual things -for example, characters and items from TV shows, large vehicles, buildings, animals, foods, and daily living goods -might become tremendously valuable accessible design toys to show children with visual disabilities a world they cannot usually grasp. On the other hand, children with hearing disabilities can enjoy most commercially available toys. 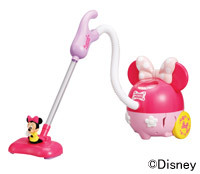 However, for the toys where the sound plays an important role, new ideas to make them "accessible" are needed. 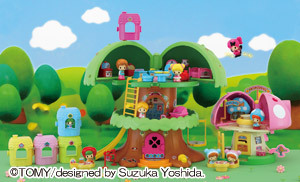 Currently (October 2012), about 90 items/series from the TOMY Group are approved as "accessible toys". The need for "accessible toys" is expected to rise more than ever since the occasion for children with and without disabilities to play and learn together at daycare centers, nursery schools and so on is increasing drastically due to national educational policies. The variation in colors and figures are designed to be tactually recognized. The tactile braille stickers for the toy are distributed free for those who wish to have them. 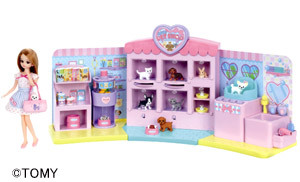 The little pet figures are authentic to touch in their shapes and textures. The parts of the toy are designed not to be accidentally fall or move. You can see the process of the game displayed on the screen. Vibrations and virtual pulling motions make the game fun. You can "visually know the cleaner is in motion by the small white balls rolling inside the cleaner's window.